Any child being treated for an injury must be assessed for non-accidental injury. Fractures in children under 3 years of age, multiple injuries of varied ages, burns and a history that does not explain the injury should raise suspicion and warrant further investigation by a combined team of paediatric specialists and social workers. Type 1: fracture directly through physis (slip). Excellent prognosis following reduction under anaesthesia. Type 2: fracture traversing through the physis that exits through the metaphysis. Excellent prognosis following reduction under anaesthesia. Sometimes requires temporary fixation with percutaneous wires. Type 3: fracture traversing through the physis that exits through the epiphysis. Requires anatomic reduction and fixation because joint line is disrupted. Guarded prognosis due to risk of partial growth arrest and angular deformity. Type 4: fracture traversing the epiphysis and physis, exiting through the metaphysis. Requires anatomic reduction and fixation because joint line is disrupted. Guarded prognosis due to risk of partial growth arrest and angular deformity. Type 5: crush injury to physis. Rare. Poor prognosis due to high risk of growth arrest. Bone remodels during growth and after injury according to the mechanical stresses applied to it (Wolff’s Law). This means that increased mechanical stress will lead to an increase in bone density and diameter. If a fracture’s deformity is close to a joint and in the plane of motion of that joint, it has a greater ability to remodel back to normal. must be taken to protect the nerve. Seen after a fall with a direct blow to the forearm. Rotation and angulation must be corrected if present. Often stable, these fractures can usually be safely managed with manipulation and above elbow cast for 3-4 weeks. Unstable fractures may be treated with flexible intramedullary rods inserted at operation and removed when the fracture has healed. 1. Torus fracture - a buckle of one cortex due to compressive force. Treat in cast for 3 weeks. 2. 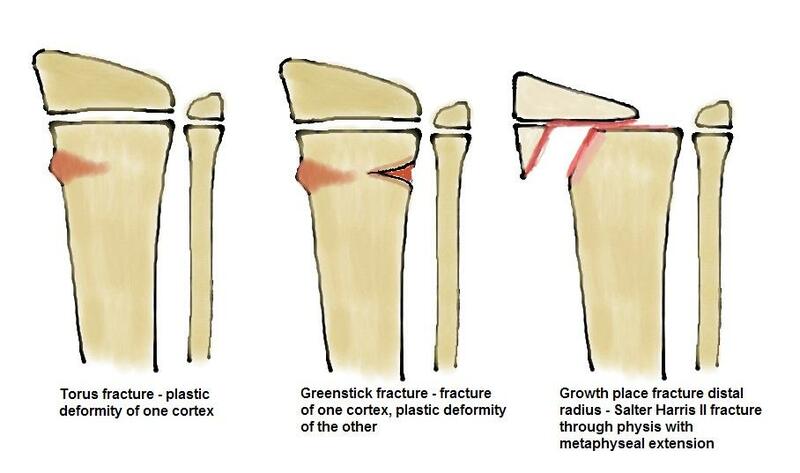 Greenstick fracture - one cortex is fractured and one suffers plastic deformation. May require reduction if angulated. Treat in cast for 3-4 weeks. 3. Complete fracture - both cortices are fractured - potentially unstable. May require reduction if angulated or displaced. Treat in cast for 3-4 weeks. 4. Physeal fracture - Most common paediatric fracture is Salter Harris type II. Requires reduction if displaced. If S-H type III or IV, require reduction and pinning. Treated according to the age of the patient. Under 6 years old, a child can be placed into a hip spica cast for 4-6 weeks. This fracture may heal with the injured side 1-2 cm longer than the contralateral side due to fracture overgrowth. Over 6 years of age, most patients undergo operative fixation with flexible intramedullary nails or plates. It is important to ensure that any fracture rotational deformity is corrected. Patients over 14 years of age nd close to skeletal matutity may be treated with a rigid femoral intramedullary nail in the same manner as an adult. These are commonly S-H II injuries but any displaced fractures, especially those extending into the epiphysis, require perfect anatomic reduction and fixation with either wires or screws. Early motion is preferable. The equivalent of an ACL rupture in an adult, the stronger ligament pulls of its bony attachment. If displaced, requires arthroscopic or open reduction and fixation. If undisplaced, may be managed in an above-knee cast for 6-8 weeks until clinical and radiological union. If displaced, requires manipulation and if unstable can be fixed with flexible intramedullary nails. Triplane fracture is a complex SH IV injury with fracture lines in all 3 planes. Requires investigation with CT scan to aid planning for open reduction and fixation if there is articular displacement. Tillaux fracture is an isolated SH III fracture of the lateral tibial physis as the medial physis has closed. If undisplaced, can be treated in an above-knee cast but if displaced, requires open reduction and fixation.